It’s not that spicy! I just wanted to put that out there from the get-go. I know when you see the word “jalapeño” you think this is going to be super-hot. If I were to use raw peppers, oh yes, there would be a fire in your mouth. But instead, I take the seeds out (where much of the heat comes from) and roast the peppers for a few minutes. Instead of an inferno, you get a milder gently sweet heat. What I also love about my panini version of the classic cheese-stuffed jalapeño popper appetizer is its tortilla chip crust spiced with cumin and cayenne. My friend Laura Werlin, a James Beard award-winning cheese expert, first introduced me to the brilliant idea of crusting a grilled cheese sandwich in tortilla chips (her Chips and Guacamole Grilled Cheese is out of this world). 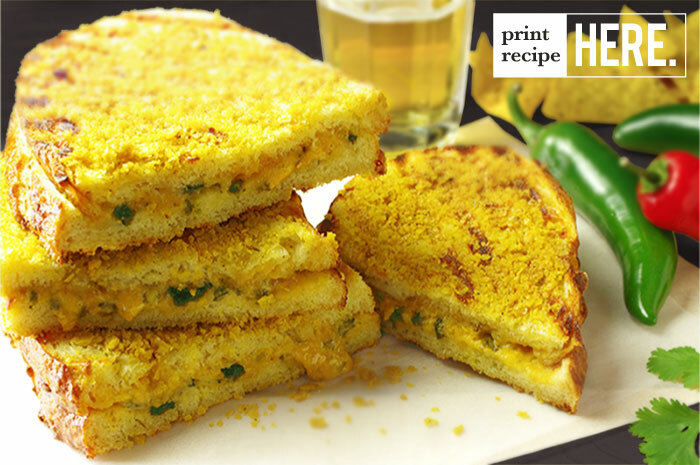 Here, that crunchy corn crust gives way to a lava of sweet roasted jalapeños and tangy melted cheese. 1. Set a rack on the top shelf of the oven or toaster oven and heat it to broil. 2. 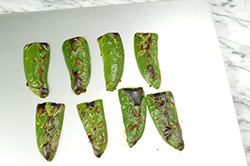 Place the jalapeños, cut sides down, on a baking sheet and broil until the skins are charred, 7 to 8 minutes. 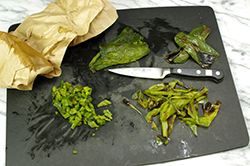 Transfer the jalapeños to a paper bag, close the bag, and let them steam until the skin of the peppers puckers and is easily removed, about 5 minutes. 3. Heat the panini press to medium-high heat. 4. 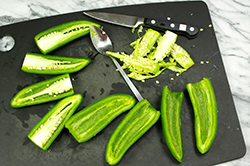 Remove and discard the skins from the jalapeños, chop the peppers, and transfer them to a medium-size bowl. 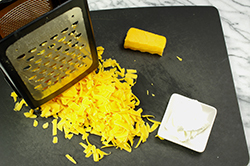 Add the cream cheese and sharp cheddar and mix them well. 5. Seal the tortilla chips in a zipper-top plastic bag and roll a rolling pin back and forth over the bag until the chips are crushed into fine crumbs. 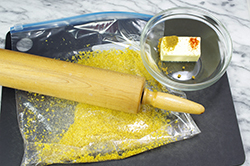 In a small bowl, mix the tortilla chip crumbs, butter, cumin, and cayenne until they’re well combined. 6. 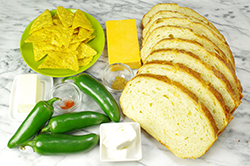 For each sandwich: Spread a layer of tortilla chip better on two slices of bread to flavor the outside of the sandwich. 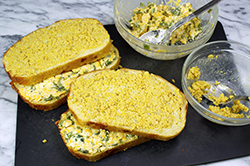 Flip over one slice and spread on a generous layer of cheese mixture. Close the sandwich with the other slice of bread, buttered side up. 7. Grill two panini at a time, with the lid closed, until the cheese is melted and the outside is toasted and crispy, about 5 minutes. Reprinted with permission from The Ultimate Panini Press Cookbook by Kathy Strahs. Copyright 2013. Published by Harvard Common Press, Boston, MA. All rights reserved.